No disrespect to gorgeous beaches with powdery white sand, but sometimes the standard-issue paradise starts to feel, well, bland. It’s time to set off for shores with strange hues of sand, alarmingly low-flying aircraft, and hot pools you can dig yourself. From Florida to New Zealand, these 10 picks take you to some peculiar beaches, all worth a visit. Take a beach walk in the footsteps of a mythical giant. Along Northern Ireland's coast more than 38,000 interlocking basalt columns descend like a huge stepping-stone highway that disappears into the sea. Volcanic eruptions fashioned the perfectly shaped hexagonal towers grouped in honeycomb-like clusters. As the legend goes, the giant warrior Finn McCool built this causeway so he could walk across the sea and face his Scottish rival, Benandonner. Apparently, Benandonner had the same idea; there are similar basalt columns on Scotland's isle of Staffa. You can explore the causeway, a UNESCO World Heritage site, on coastal and cliff paths or stop in at a new visitor center set to open this summer. Take a self-guided tour or join a group with a guide to spot distinctive stone formations, including the Giant's Boot, the Giant's Harp, and the Organ. If You Go: Near Bushmills in Antrim, Giant's Causeway is a one-hour, 25-minute drive from Belfast and one hour, 10 minutes from Londonderry. Translink train and Ulsterbus services are also available. What was once the town dump is now a treasure that sparkles in the northern California sunlight: Glass Beach. Until the late 1960s, Ft. Bragg residents would hurl their garbage from the overlooking cliff into the sea. But decades of wave action tumbled the old car taillights, perfume bottles, six-packs of beer, and other refuse, transforming it into tiny, translucent, smooth-edged pebbles of every imaginable color and shape. This beach has the highest concentration of sea glass in the world. And it's so tempting to pocket. 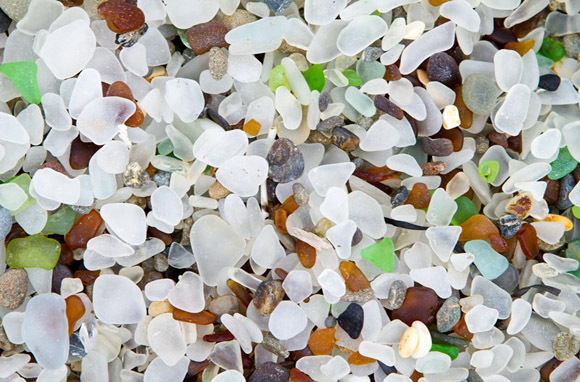 Unfortunately, collecting is off-limits, as Glass Beach lies within the protected MacKerricher State Park. If You Go: Park at the end of Elm Street and walk down the trail to the beach. If you want to take home some sea glass, stop in at the International Sea Glass Museum shop a few miles south on Highway 1. Santorini's unusual beaches are the stuff of sci-fi novels. Volcanic explosions and collapses have left behind swaths of black sand, lunar-esque landscapes, and one sandy stretch that looks like it belongs on Mars: Red Beach. Towering red lava cliffs drop right down to a smallish red-sand beach and into the Aegean Sea. From a distance, even the shallowest water looks like blood. Despite its remote location, the beach still gets crowded with sunbathers basking on the warm, dark sand. Exceptionally clear waters make this an interesting spot for swimming and snorkeling. Avoid visiting midday in summer, when the beach underfoot can be scorching. If You Go: Fly into Santorini from Athens or arrive by ferry. 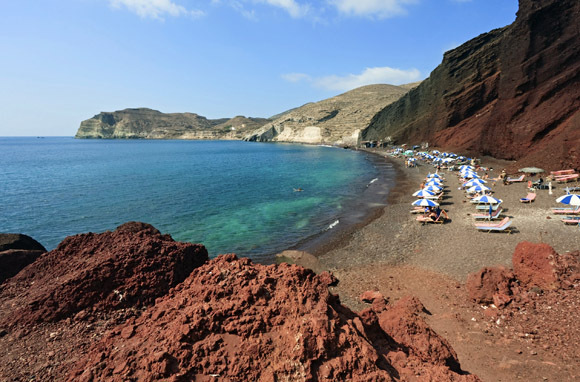 Red Beach can be reached either by boat from Perissa and Akrotiri or by foot, a 10-minute walk from Akrotiri. Check with the Greece and Mediterranean Travel Centre for Santorini deals. Don't expect to get uninterrupted time with your Kindle on this beach. At the end of St. Maarten's airport runway, Maho Beach gives beachgoers a thrill every half hour: jumbo jets taking off and landing nearly within arm's reach. Only a narrow road separates you from the runway at Princess Juliana International Airport, the second-busiest airport in the eastern Caribbean. With the heat from the jet blast and winds of up to 100 mph whipping the sand, every takeoff and landing feels like a close call. The peak arrival time for the long-haul heavies, Boeing 747s and Airbus 340s, is between 1:00 p.m. and 4:30 p.m. If You Go: Check in with the Sunset Bar & Grill on the beach for the day's flight times. Each of the pizzas on the menu is named after a different airline. It's anyone's guess what the 40 rock carvings on Wrangell's Petroglyph Beach mean, and that's part of the intrigue. There's a strong indigenous Tlingit influence here on the tiny island of Wrangell, tucked away on the Inside Passage of southeast Alaska. And scientists believe it was the original local Tlingit who etched out the rock artwork some 8,000 years ago. Visible at low tide, unique faces, spirals, birds, salmon, and a killer whale appear on boulders and bedrock near important salmon streams. Want to speculate on interpretations? For some petroglyphs, slanted light at sunrise or sunset improves visibility; others are easier to see when rain leaves the rocks shiny and wet. If You Go: Alaska Airlines flies direct from Seattle to Wrangell and has connecting flights from Juneau. Or, you could sail on the Alaska Marine Highway Ferry, which takes two days from Bellingham, Washington. This 95-mile coastline along England's southern edge is a geologic storybook of the last 185 million years. Stroll the shore and you'll see well-preserved dinosaur fossils and footprints, water-worn limestone arches, and striated rock faces. But the most unusual stretch is near Studland in Dorset, where stark white chalk cliffs and sea stacks look like towering icebergs that have slowly calved over the centuries. Some say the most famous of the white stacks, the Old Harry Rocks, are named after Harry Paye, a local 15th-century pirate who stored contraband nearby. During exceptionally low tides you can walk out to the smooth stacks from Studland Beach, but they're best seen by kayak, especially when the sunset stains them red. If You Go: Take the train from Waterloo to Poole or the National Express bus from Victoria to Poole. Dorset Kayaking leads gentle paddling tours. You can climb through arches and jump from steep cliff faces on a Land & Wave coasteering experience. On weekends at low tide, Hot Water Beach transforms into a spa party. Beachgoers bring shovels and dig their own soaking holes that geothermal mineral waters bubble into and fill. It's a strange sight, people lying in a patchwork of little pools instead of swimming in the sea just steps away. Then, less than four hours later when the tide comes in, the scene dissolves, wiped clear. Come during the week to have the beach to yourself, and be sure to bring your own shovel. You can camp next to the beach or rent an inexpensive cabin in the nearby Top 10 Holiday Park. If You Go: Air New Zealand flies nonstop (about 12 hours) from Los Angeles and San Francisco to Auckland. Hot Water Beach is on the Coromandel Peninsula near Mercury Bay, a two-hour drive from Auckland. Sharks are a rare sight on Sarasota's Venice Beach today, but the hundreds of fossilized teeth that wash ashore here each year are a constant reminder that these waters teemed with sharks in prehistoric days. You can't imagine how embarrassingly addictive searching for the little black, brown, and steely gray triangles is until you try it. Even without the fancy metal or wood sifting baskets sold locally, you'll still likely find a small handful in an hour or two in what has been dubbed the Shark's Teeth Capital of the World. If You Go: From downtown Sarasota, Venice Beach is a short drive across the Intracoastal Waterway bridge. Visit in April during the annual Shark's Tooth Festival for live music, fresh seafood, sea-related art, and displays of teeth. 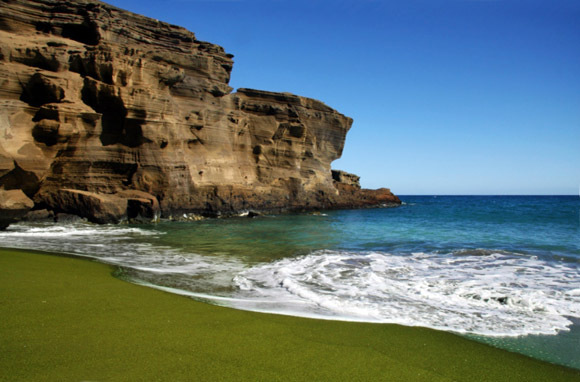 It's not moss or algae that gives green sand its bizarre hue but instead an olivine mineral created by volcanic activity. Rich in iron and magnesium, olivine is one of the first crystals to form as magma cools. And Hawaiiâs remote Papakolea Beach (pictured), an eco-sensitive area on the southernmost tip of the Big Island, is perhaps the most famous example—but is difficult to reach. You can also see green sand in the Galapagos. Punta Cormorant on the uninhabited Floreana Island spreads out like an emerald pasture lapped by the incoming surf. The green sand is reason enough to make the day trip from Santa Cruz Island, although the large colony of pink flamingos in the adjacent lagoon sweetens the deal. On Flour Beach, just a short walk over a hill, green sea turtles nest and several species of rays cruise the shallows. If You Go: Papakolea Beach, about three miles east of Ka Lae (South Point), is accessible only on foot or by four-wheel drive. To reach Punta Cormorant, fly direct to Ecuador from Miami, Houston, or Atlanta. You can access Floreana Island from Puerto Ayora on Santa Cruz Island. Latin Trails leads adventure tours. On an uninhabited beach in North Carolina's Brunswick Islands—a 30-minute walk from civilization—is the little black mailbox that could. In 1981, when land-development proposals surfaced, a local resident planted the mailbox, with a notebook and pencils inside, in this unlikely spot as a plea to help save the 1,300-acre barrier island. And it worked. Old-fashioned handwritten letters helped secure Bird Island's state reserve status. Even after the island was saved, though, the letters of fond memories kept showing up. Then came a pair of reading glasses. 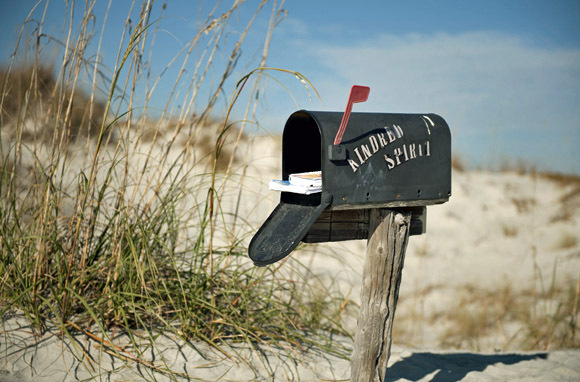 Then a steady stream of wishes, dreams, words of encouragement, and tales of love and love lost arrived from visiting tourists who, still today, sit on the adjacent bench to bare their soul at the Kindred Spirit Mailbox. If You Go: Bird Island is a 35-minute drive north from Myrtle Beach, South Carolina, and an hour southwest of Wilmington. For solitude and the best rates, visit October through May.